Have you been to Kingston Upon Hull with Hull Trains? Last Bank Holiday weekend, I went to Kingston Upon Hull, the next city of culture in 2017, in East Yorkshire in the north of England to check out why the city was so deserving of the title. Guess what, it’s my home town. So, shouldn’t I know why Hull is that good? I do. But only as a resident. Not a visitor. So, this year as I return on a monthly basis, each time for a weekend, I’ll be finding out what visitors can do, sightsee and enjoy in Hull & Beyond! Have you been? Is there anything you think I should be doing in this gorgeous little corner of Yorkshire? Let me know in the comments below or even pop me a tweet at @rexyedventures or perhaps leave a message on my RexyEdventures Facebook page. Did you know what there’s 90 direct train services running between London Kings Cross and Hull and the Humber region a week? Every time I go back to visit my family, I always log on the Hull Trains website where I can find up to 60% off train tickets providing I enter through their frequent newsletter that arrives into my inbox. But I didn’t realise how this award-winning train service that has brought about a 97% satisfaction rate in the National Rail Passenger Survey in January 2016 is so key to tourism for Hull. Projected to carry a million passengers this year, they are more than ready to bear the name, Hull, on the side of their carriages and treat visitors to Hull their very first impression of the city. So what features are they putting in place? Free 4G enabled Wi-Fi throughout your journey. – This is what I desperately need on every train journey within the UK. So, Hull Trains stands out heads and shoulders above other train operators. 15 mins of free Wi-Fi on other train networks? Two words. My arse. Tasty treat in the Cafe Bar – they always seems to be manned by loveable mums, with their Hull accents, who see us laughing our heads off about anything. Travel in style in First Class – sometimes I nab a good deal to travel in first class and then I’ll be jumping with joy on my bed. With exceptional service, free coffee, drinks and meals, you’ll see your 2.5 hour journey go by quickly in comfort! 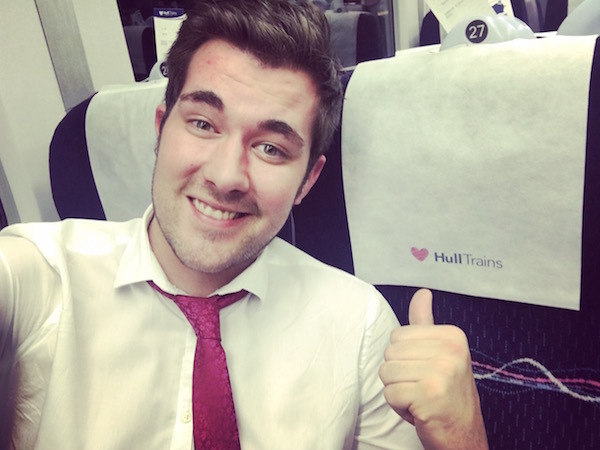 Have you ever travelled with Hull Trains? What was your experience with them? Leave a comment below!